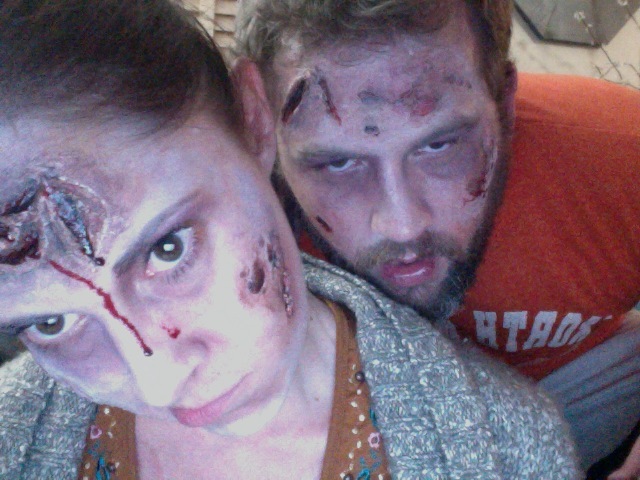 I came home from work to a zombie version of my husband. He goes all out around Halloween, so I was not surprised. 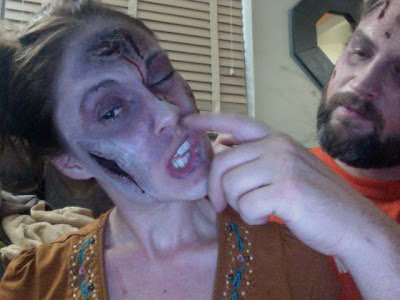 He'd dug up his old effects making up from acting school and was practicing for tomorrow's staff zombification. I was delighted to be his next victim. It was rather gory, but oh so much fun. Then we had ourselves a good ol' fashioned zombie photo shoot. I was either laughing or looking very confused in most of the pictures. I need to practice my walking dead face. So the trick (that all zombie make up artists must know) to getting nice deep gashes is cotton. After you've painted some liquid latex on your skin, twist thin strips of cotton ball, paint one side of the cotton with liquid latex and stick it to the latex on your skin. Repeat with another piece of cotton to form the edges of an open wound. (eeeew!) Cover the whole wound with more latex to blend and get creative with make up (layer black, dark red and blood red for wounds) and fake blood. To get a lovely rotting flesh effect, (equal parts of gross and awesome) paint liquid latex on your skin and allow to dry fully. Then rub parts of the latex, which will stick to itself and look like peeling skin. Paint inside the peels (getting the color under the "skin" with a small brush) using the same three layers of colors as above. It's sure to make the kiddies scream. ;) Happy haunting!